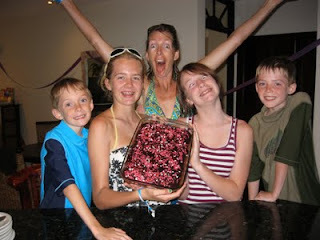 Adrianne's cake - notice only my three kids look normal. Our hardy student group that toured downtown in the mini monsoon. Kevin, his friend Sam, Joshua and his friend, Santiago used their umbrellas to protect them from the rain that was blowing sideways while under a cement gazebo.